Sagrada Reset was initially published on Kadokawa’s Sneaker Bunko light novel label with art by Shiina You, the seven-book series starting in June 2009 and finishing in April 2012. While the series never found massive popularity, following the success of Kono’s third series, Kaidantou, Kadokawa brought Kono back to revise and polish Sagrada so they could republish it on their non–light novel label, Kadokawa Bunko. These revised editions, with new cover art by Torocchi and more accessible Japanese titles, were published one volume a month from September 2016 to March 2017. Along with these new editions, a pair of live-action films, a TV anime, and a new manga adapting the series were announced. Left: Sneaker Bunko edition v1 cover. Right: Kadokawa Bunko edition v1 cover. Broadly speaking, Sagrada Reset is divided into two parts of three books each. The fourth volume, GOODBYE is not EASY WORD to SAY, is a collection of short stories that don’t really fit anywhere else, serving to fill in some gaps in the chronology and strengthen the themes without getting in the way of the core narrative. Episodes 1-11 of the anime cover the first part, mixing in four of five stories from the fourth volume. What does it mean to be “human”? What criteria—both internal and external—does a person use to determine their actions? How do people communicate—both individually and as part of a larger collective? What factors contribute to a person’s perception of themselves and others, and how does that perception influence (2) and (3)? To what degree are people “formed” by their memory of the past—whether perfect, or flawed and incomplete? What role does “fate” or “foreknowledge” play in (2) and (3), and does a real or perceived lack of free will stemming from it affect (1)? You could keep drilling down to more and more specific questions, but ultimately, it boils down to one long introspection on the concept of humanity, examined through the lens of an isolated city filled with people with (mostly) low-key superpowers. But rather than make them “different” from us, their abilities serve to highlight and enhance their humanity. Now, on the script side, series composer Takayama Katsuhiko has taken it upon himself to write every single episode personally—as he seems to like to do. He’s chosen to omit the vast majority of the books’ inner monologues, which is probably wise for an already wordy series, though it does cut us off from most of the cast’s headspace. The novels do a fair bit of perspective jumping—particularly with Haruki, who does more thinking and observing than talking—and unfortunately, the anime’s rather weak production doesn’t seem to be able to communicate that information very effectively. Takayama also cuts down a lot of the dialogue—he’s merciless with his axe, even when working from relatively short stories where he could easily include more. Anything that could be inferred or is not in service of the themes is chopped, but otherwise he follows the original text fairly closely. I had my worries when it was announced he would be the series scriptwriter, as I don’t much associate him with this kind of quiet, introspective material, but he’s done a stellar job so far. The first two episodes account for roughly ~85% of the third book, MEMORY in CHILDREN, which is largely a flashback. In its original form, the flashbacks are interspersed with scenes from the present day, where Kei reflects on the events leading up to Souma’s death with his newfound knowledge that she had the ability to see the future. This, in addition to the fact that the flashback comes at a point where Kei has already gathered all the pieces he needs to resurrect Souma, and that they were all prepared for him by her, casts the events of two years ago in a very different light. There was never an accident—it was all part of her plan. The adaptation omits a few pieces of the flashback—most notably a scene near the end, after Souma’s death. Nakano Tomoki tells Kei that the day before she died, Souma asked him to send a message from herself to herself two years in the future: “Can you hear my voice?” A way for her to find out, after she comes back to life, whether the world considers her to be the same person. The question of what defines a “person” becomes one of great personal importance to Souma, rather than her just musing about philosophical ideas well beyond her age. While this bit could have been kept to add an extra layer of mystery to the circumstances surrounding her death, saving it for episode 10 was probably for the best so the entire series doesn’t end up revolving around that one event. It’s a tough balancing act they made for themselves by putting these events at the very beginning of the show, but I think they handled it surprisingly well in the end. Here we jump back to the first book. The novel opens with a short scene where Kei goes to deliver a message to Tsushima—that the MacGuffin is going to be stolen—a somber few pages that has him reminiscing about a conversation he had with Souma concerning her love for messages. The flashback bit reappears in the fourth episode, and given how much they had to condense the book to fit it into two episodes, it’s not a surprise the scene didn’t make the cut. The anime instead opts to open the arc with Tomoki’s message to Kei reminding him of his meeting with Murase, a scene which is repeated several times throughout the two episodes. While not as straightforward a proclamation of the story’s themes, it’s more than sufficient to get the point across. Reducing the focus on the nature and mechanics of language/communication—particularly Souma’s fixation on it—is somewhat unfortunate since it becomes important later on, but the core themes of the novel are still in tact, and tightening up the beginning leaves them with plenty of room to explore it in depth in the second half. This episode covers the first short story in the fourth book, which brings us a few months before the previous two episodes. It’s a straightforward adaptation, and thematically the episode serves as a nice bridge between the previous and following arcs: much like Haruki, Sera Sawako has a fixation on rules (though external rather than internal), which is rooted in a memory of something her elementary-school teacher told her years earlier. These episodes cover the second book—excluding the epilogue, which shows up in episode 10. By this point, the adaptation pace has slowed down enough they’re not cutting out big chunks anymore and have time to flesh out the story’s themes more while still maintaining narrative cohesion. Kei’s motivation for making contact with Eri—her father having ties to the Bureau—is omitted, as the flashback comes from her perspective instead of his. It’s not a hugely important piece of information, but it does contextualize his actions somewhat. Presenting Kei as a more purely “villainous” character in this situation fits better with the themes of our memories not living up to reality, though. We also lose another Souma flashback scene, this time with her mulling over the definition of the word “world”—what exactly it encompasses, and how no two people’s concepts of the world are the same. Ultimately this is probably for the best, as in the novels, the scattered, out-of-context flashbacks make her out to be this mysterious presence who seemingly played an important role in Kei’s life, but the extent of which remains mostly unknown until her proper appearance in book 3. But since the third volume came first in the anime, keeping Souma too much in the spotlight risks potentially giving the narrative a “girl is killed off to motivate the male protag to do stuff” bent, which is clearly not the case here (at least not in that sense—she does die to make him do stuff, but she’s the one pulling the strings the entire time). This episode covers the 50-page short story that closes off the fourth book—another flashback, this time to a couple weeks after Souma’s death. It gives us a glimpse at how Kei and Haruki reacted in the aftermath and shows how the two ended up in their sort of uncomfortable codependent relationship we see in the present day. At the end of the episode, Kei resolves to find some way to bring Souma back to life—which ties in nicely to the next one, where that actually happens. Given the series’ structure, this is pretty much the best possible place to put this story. Sticking it after episode 2, where it would fit chronologically, would again put too much focus on Souma as “the dead girl,” but on the other hand, had the books been been adapted in order and as-written, there wouldn’t be a good place to put it at all. Integrating it into MEMORY in CHILDREN would likely make it too bulky, muddy it up thematically, and interrupt the flow between v2 and v3. And here we have the remainder of the third book, covering the present-day scenes where Kei and Haruki gather everyone needed to bring Souma back to life. In place of the Mari flashback, this episode steps slightly farther back in time, covering a ~20-page episode about Kei’s first week in Sakurada, following immediately after the call he received from the Witch in episode 6. By focusing on this particular story, they put a greater emphasis on the questions of destiny and free will also raised by Souma’s ability. When Kei awakened to his power, he was still trying to decide whether he wanted to stay in Sakurada or not, but because of his ability, he had that choice taken away from him. Through an opportunely timed reset, though, Kei is offered a second chance to choose for himself. But the question remains: has he really been allowed to choose anything? Or has he just been riding the rails, playing the role of “protagonist” in the all-seeing Souma Sumire’s story? And what about Souma herself? Does her being able to see the future bind her to a predetermined path? Was her death and subsequent revival all just part of “destiny”? Or was it a loophole in the system, a chance to escape enabled by meticulous planning and a similarly well-timed reset? It’s a cleverly conceived parallel, bringing what was a short aside in the book to the forefront in a way that takes full advantage of the 25-minute TV anime format—perhaps the greatest testament to the strengths of this adaptation. The episode both stands on its own with a strong thematic foundation, while also carrying the torch from the series’ opening two episodes and into the second half. Stop there, maybe with an episode for everyone to celebrate the reunion, but otherwise we’re all done here. Mission accomplished. Dive right into the next act, likely setting up a few new mysteries or plot hooks to keep the audience hungry for more. Sagrada Reset, meanwhile, takes a week to ignore the story entirely with a slice-of-life episode focused on Haruki Misora outside of her interactions with Asai Kei. It’s an unabashedly brutal shift in tone—from solemn pondering on fate and the meaning of life to oh-so-serious deliberation over whether a tart or ice cream would make a better sick-day treat. But most of all, it’s an unmistakable declaration of intent from the staff: character and thematic threads always have and always will take priority over ~plot progression~. Up to this point, Haruki has been shown to have an extremely unhealthy dependency on Kei—their ability to function as a team relies on her unconditional trust in him and his judgment. Her dependency runs so deep that she can no longer use her own power without his explicit orders. And while Kei often pushes her to think and act on her own more, that hasn’t stopped him from taking advantage of the effectively total control he has over her when he needs it to get something done. This episode removes Kei’s direct influence from the equation (he’s still a factor, though—baby steps), first showing Haruki clumsily attempting to make friends with Nonoo Seika, and then trying to decide what foods to bring him for a sick visit. In both cases, she’s acting of her own volition and for her own personal satisfaction—something we haven’t seen much of in the first half. Why put these little vignettes here, though? There’s no story reason this episode had to happen at all, let alone be positioned as a very conspicuous dividing line between the end of the first half and the beginning of the second. The answer’s simple: because Kawatsura and co. want to make their intentions for the series loud and clear. This is what Sagrada Reset is all about—people. Humans with flaws and worries and tangled webs of interpersonal relationships, whose growth takes priority over everything else. And this is what we want you to be thinking about as we move into the second half, more than crazy time manipulation shenanigans and bringing girls back from the dead. Those are all important as well, but at the end of the day, being human comes first. Period. 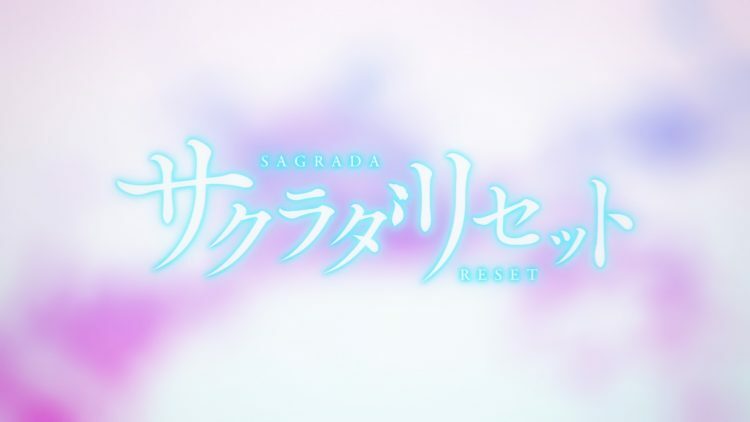 tl;dr: Sagrada Reset is a very strong adaptation of one of my favorite novel series, and I couldn’t be happier with how it’s turning out.